LAND VALUE with a REALLY cool home! 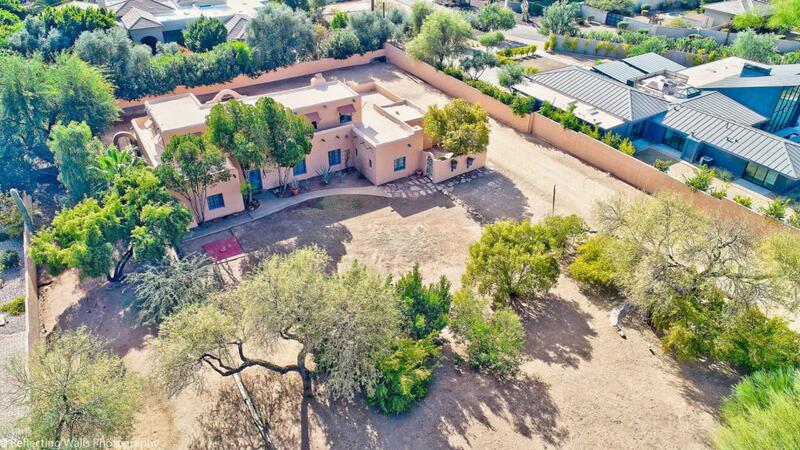 This RARE 1926 PUEBLO REVIVAL in the HEART OF ARCADIA is an ADOBE CONSTRUCTED historic home designed AND built by ROBERT T. EVANS who's infamously noted for his Adobe construction. 3,126 SF of home sits on just under an acre! 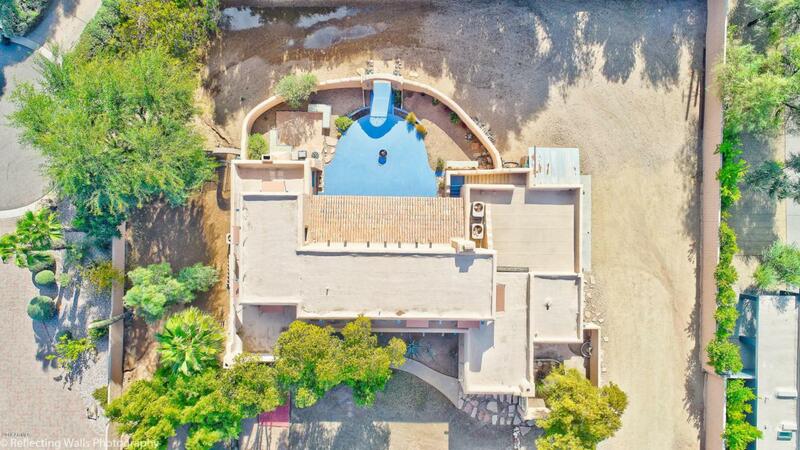 Don't let the Camelback address fool you; the home is recessed around 100 yards. MAKE SURE TO WATCH THE DRONE VIDEO! (CLICK TO READ MORE)One of many historical significant pieces of history is this Adobe is named The DR. CHARLES C. BRADBURY HOUSE & was THE FIRST home built in this subdivision! Once featured in Scottsdale Homes & Gardens Magazine, this glorious home flaunts 2-stories & 360 degree wrap-around roof Veranda decks, Parapets w/HUGE Vigas, 3 bedrooms, 2 full and 2 quarter baths, 3 Adobe fireplaces, soaring ceilings & a substantial amount of historical architecture makes this home a beauty! 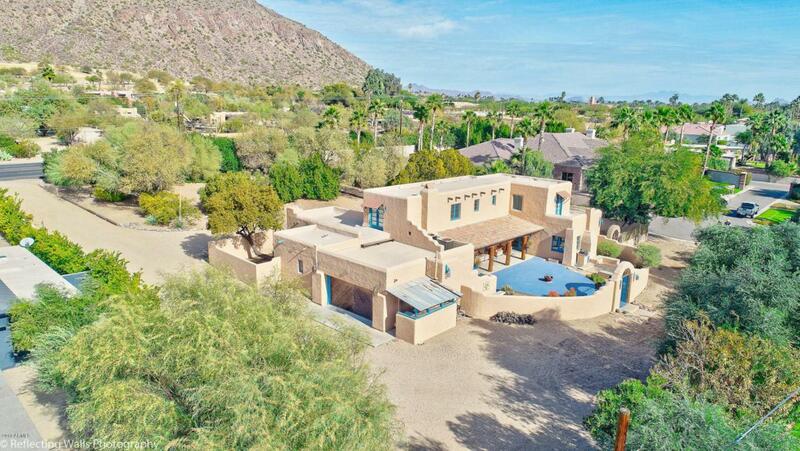 With a 2-car detached garage just off the base of Camelback Mountain which is IN YOUR FACE, the views are mind-blowing, romantic, spiritual, breathtaking, stunning & exquisite! This home is recessed far back from the street with a circular driveway offering much privacy, luxury and splendor while radiating character, charm, and elegance. The natural desert grounds and rooftop decks look out to views of Camelback Mountain that are simply profound. This home is a rare survivor in an area known for its genial past and chronicle, rich, local history. Roll back in time to see an incredible piece of the past that has undergone a high-end period restoration keeping the historic integrity combined with high-end, modern day flare with no expense spared while being immaculately maintained over the years. This enchanting home's open floorplan with an abundance of natural light is a perfect sanctuary for families and marvelous for entertaining! Almost every room has French doors leading to either the bold yet tranquil, over-sized rear courtyard with three separate sitting areas, covered patio, built-in barbecue and stairwell to the upper wrap-around deck along with access to all rooms upstairs and down. Upon entering front, you can't help but to notice the original, arched wood front door with rod iron decor welcoming you into the over-sized foyer capturing your eyes with its high ceilings, circular archways throughout, original, scored concrete floors which flow into the formal dining room, living room and half bathroom. It's impossible not to be in awe of the original, wood spiral staircase through the entry. The huge formal dining room has its own Adobe fireplace with a prominent, exposed brick archway access into the over-sized, remodeled kitchen but not before you stroll through the original Butler's pantry with striking, original restored built-ins with original hardware and glass. The thoroughly remodeled kitchen also features the original Adobe brick oven converted into a kitchen fireplace, exposed brick soffit, granite countertops, kitchen island, stoned flooring, custom cabinets throughout for built-in electronics, gas stove top, built-in oven and microwave, high-end stainless appliances, canned lighting and French doors leading to the back courtyard. The over-sized living room also has its own fireplace, original wooden beamed ceiling separated by multiple coves. Truly a must-see! Open the French doors for yet another direct access to the amazing rear courtyard. Off the living room is the downstairs master suite with a luxurious, jetted spa-like tub, walk-in shower, a hideaway safe, his & hers sinks. two walk-in closets, its own Adobe fireplace and French doors leading to its own private courtyard. Take the original wooden spiral staircase upstairs where you'll find two split, large Master Suites separated by an elongated hallway, each with their own French Doors leading you to the full, wraparound deck with breathtaking views! The full upstairs bathroom has its original clawfoot tub and built-ins. Both upper bathrooms are restored to the period. All upstairs flooring is wood except the bathrooms which are stone. The custom, cedar closet in the hallway would make an exceptional wine storage room. There's even an original built-in wall ironing board in pristine condition. Most of the homes original hardware throughout is intact and canned lighting throughout the home offers a serene atmosphere. The grounds are full of natural desert landscaping plus landscaping by design offering irrigation. Storage space is abundant. A few extra perks are the proximity to Fashion Square and Biltmore Malls, Sky Harbor Airport, LaGrande Orange, Postinos Wine Cafe, Scottsdale, Paradise Valley, Downtown Phoenix, the Hopi/Arcadia school districts, and SO much more! 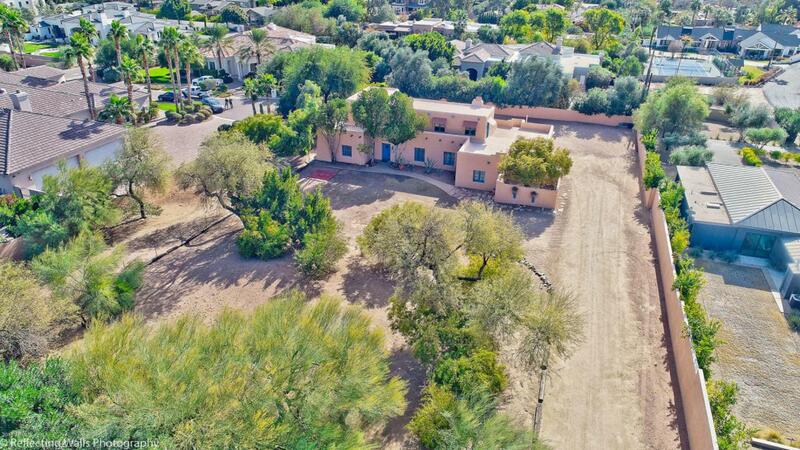 This is truly a rare opportunity to own a piece of history in the most coveted area in Phoenix; The ARCADIA Neighborhood! Seriously a must-see home! Cross Street 56th Street & Camelback Rd. Listing courtesy of Wise Choice Properties.